No one says it better than kids themselves. We recently spent an evening with the youth soccer players at Charlotte Soccer Academy. We spoke with kids in all age levels about their thoughts on soccer in general and the Revolutionary Soccer Rinks. Kids said they loved it when their Charlotte Soccer Academy coaches broke out the Revolutionary Soccer Rinks for practices. The rinks keep practice moving and make it more fun. "Working in tight spaces, it helps you in the midfield," said one player. "Like if your team is playing a 4-5-1 you need a lot of combinations in the middle. And there's going to be another team obviously, so you're going to have to work in tight spaces." Plus, kids are running around quite a bit in soccer practice. This means when they don't have to run to catch the stray balls that get hit out of bounds, they can spend more time working on their skills and drills. 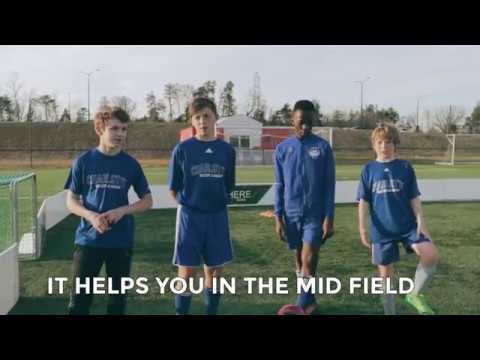 "Normall if you hit it out it will just go out and you have to chase after it," said another Charlotte Soccer Academy player. "But with this it just bounces right back."